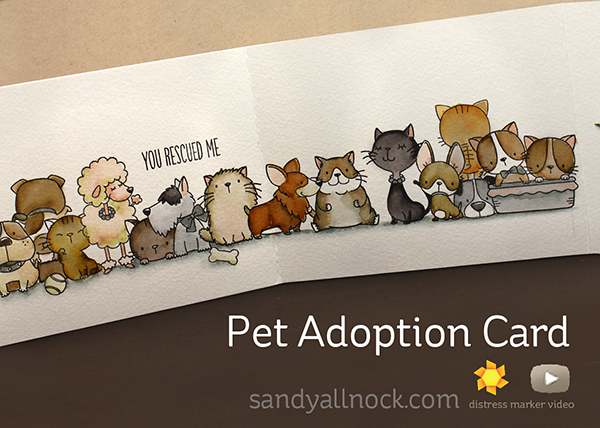 Pet Adoption Card, Distress Marker Hex Chart, and winners! 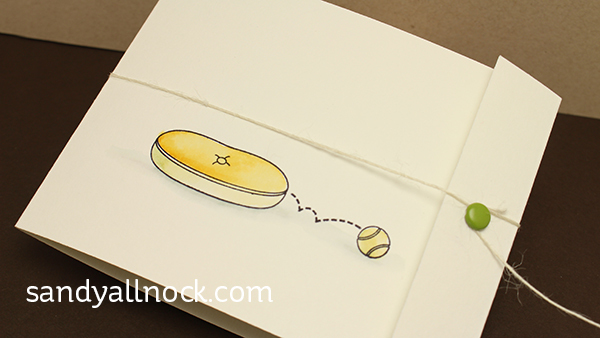 I had so many of you asking me for tips on watercoloring with Distress Markers….it was time. I saw Tim at CHA this year and we got to talking – uh yeah, had to admit I wasn’t FSS. So thanks to Tim for fixing that for me! I saw these cat and dog sets from MFT…ohmygoshcute. I had to color them. All of them. Every last little one. So they ended up all inside one card – a huge group of happy-to-be-adopted babies! And colored them in my new Distress Markers. In the video I share a few tips, but there will of course be more to come in the future. Watch the video below or click HERE to see it in HD on YouTube. Measurements on this card – left panel 5-1/4; center 5-1/2; flap 1″. Annnnnnd…a Distress Marker Color Chart! Gretchen Sheridan – this treat will help her recover from all that laundry! Maria Durfee – that dad of 5 is going to LOVE what I got him. And a little something he can send to his deployed wife too. Mandy Salazar – baby #4! oh my. Extra love to her. Mary Prasad – crafting over skype? What a sweet way to maintain your friendship! Karen @ MisplacedMojo.com – I’ll tuck a little get up and go in for her. Oh how I understand the HRT battle! 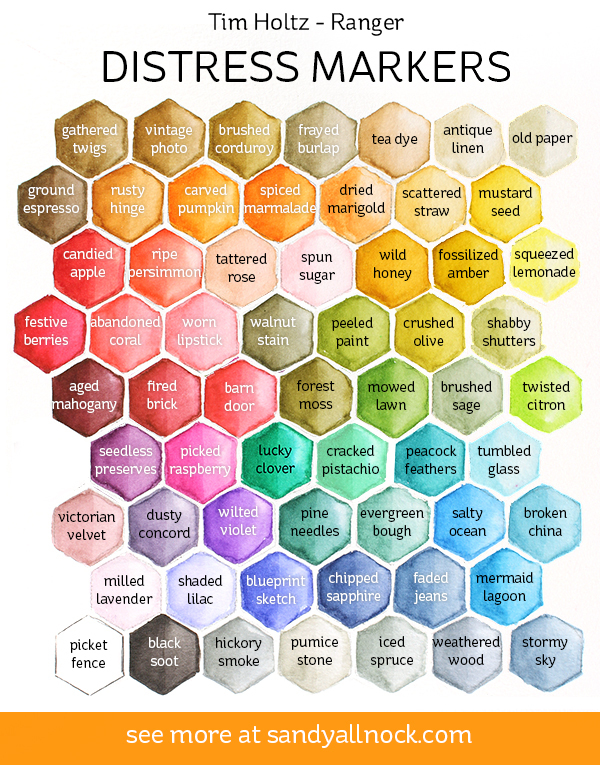 The hex color chart is great. I was wondering if you had a video of you making it- even just a few of the hexagons… I’m trying to replicate it myself, as I find it’s a great exercise in learning technique, and gives me a “live” chart. I’m trying to mimic yours, but can’t quite get the nice ombré effect your hexagons have. I love the split technique as well, where there is that subtle line down the middle of three hexagons, but I can’t seem to make it subtle – it’s either very obvious, or disappears. sorry, no video of that…. Whats with the safety pen? Is it something needed to use the markers? As I recall, I cut a piece of 9×12 down the center at 4-1/4; folded at 5-1/2 and 11, leaving that 1 inch flap for the closure. Hi, not sure whether you’ll answer my question to this old post. I’m trying to pick out distress colors that will work well for ombré effects. But from the chart, sometimes a certain color seems to be in a weird position. Can you help to guide me in selecting good ombré combo by using your chart? Ordered these stamps and they came yesterday…perfect timing as I just watched your 6th lesson on coloring animals….I am a member of a dog club so these stamps should get a lot of use. It’s not a downloadable – just a pinnable chart. Love your card and how you mixed the colors to get neutrals. I always love your charts too. Thank you for sharing them with us. Hey Sandy, I couldn’t find your email address anywhere on your site, so I used the Contact page for getting you the mailing address for the TLC winner info. I have no idea how often you check that though! I really hope you got it, but if you need anything else from me feel free to reach me at karenpagega at gmail dot com. Thanks so much for all that you do!!! Oh thank you so much for this chart!!! You are brilliant! Love the card, too!!! I’ve got 3 cats and a dog rescued from shelter, so you can imagine how much I love your card. It’s so cute…. really great and inspiring. Thank you so much for sharing your creativity with us. I always love to watch your videos! You are SO talented that sometimes I just sit there watching in admiration. No, really! The actual artistry you were gifted with is just amazing. I say it all the time when I watching but you just can’t hear me. LOL I also want to thank you for the Hex chart for the Distress inks. I love it! Thank you for all your awesomeness!!! Love the coloring you did with these markers! Blending with the water makes the colors so different. I bought these markers the whole set when they first came out. They are now all dried out. When I asked about why did they dry out so quick. I was told that I didn’t put caps on all the way. when I told them I did they said you have to use them all the time or that happens. So make sure you use them alot. Great card! Love the tutorial and thanks for the hex chart! Congrats to the winners & their friends/family! Great card, and worthy message!! Lol I was gonna ask the same thing!!! Thanks for the video. I was a little turned off by Distress Markers because I couldn’t blend the harsh lines away. I’ll try your paper suggestion. You probably can’t really answer this here, but I am wondering, is there a big difference in the Distress markers and the Zig markers, (other than having matching ink pads) and do you have a preference between the 2? Love the card! Zigs are brighter, have a brush zigs are brighter, have a brush nib, and realllly react with water. They can also be used with no waters. Distress are more natural colors, have a regular marker nib, and are more controllable with water. My preference I think are distress markers, but I haven’t use them long enough to be certain long term. Great video! Congrats to the lucky ladies who won prizes! Oh My Goodness…feeling BLESSED, to be was chosen to receive the Mini Misti!!! Thank you SANDY!!!! I’m giddy with excitement! Really cool video! loved seeing how the distress markers watercolor. Question- What size siler brush did you use? Probably a 4 or 6? great card! Many congrats to the lucky winners! Oh my… I love this! I’m totally going to CAS this card! Love the card, but oh, my, goodness….I am SO glad to have your hint about the Canson XL paper. I’ve tried all kinds of papers and could not get away from the harsh edge. I’ve been disappointed with the Distress Markers for that reason. I’m off to try again with the Canson paper. (I agree with you – what’s the point of markers if you have to use them like watercolors?) Thanks, Sandy! Oh what a wonderful card and so many wonderful tips as you painted along in the video. Thank you muchly. Sandy, your thoughtfulness and generosity is heartwarming. I am sending you big HUGS! Love, love, love this card! These stamps are on my wishlist and now I really can’t wait to get them! Thanks for sharing this card and the hex chart. Are you going to make the chart available in your shop? Hope so! No because few can print on watercolor paper—emails in my inbox for tech support would be overwhelming. Love the card and really appreciate the hex chart! Thanks so much, Sandy! This card is WONDERFUL! I’m going to try and recreate it. I actually have the stamp sets and have been using them for days. I like to make cards for a local rescue group called The Arrow Fund for them to sell at their different events. This will make a perfect addition. Thanks for sharing, I LOVE it. Congrats to your Mini MISTI winner and I am happy for the TLC recipients! Kindness matters and you obviously are truly kind! Ohhhhh…..these stamps are on top of my wishlist. I make cards for our local animal shelter and these are purrfect. Sandy, did you mean “Lucky Clover” , not “Lucky Charm”, I think??? This is a post that’s chock full of goodness! 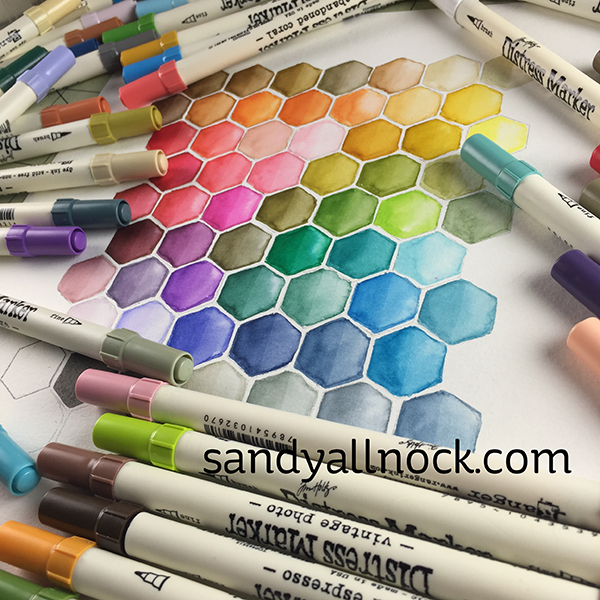 Hex Chart for Distress Markers – wow that is SO useful! Pet adoption – adorable card and a great message! Sending TLC where you saw a need – so kind and generous! Great video. Very cute card.